That’s right folks, it’s that time of year again: Cologne Karneval, one of the most auspicious and festive of the European carnival events. Thankfully, whether you’re in the northern hemisphere or the south, there’s always a way to get in on the action. Say what you want about the Germans, they know how to throw a good bash – and milk the festival season for all it’s worth, so much so that they actually create a new season for festivity altogether. While Cologne Karneval generally happens in February, it technically starts at 11.11am on November 11 the year prior, when the ‘5th season’, or carnival season begins. Suspended during Christmas, this season ramps up again in the new year, and culminates in the week long ‘Crazy Days’ in Cologne. The ‘Crazy Days’: what’s it all about? Cologne Karneval is a hallowed European tradition, a festival like no other and one of the most important dates in the German cultural calendar. 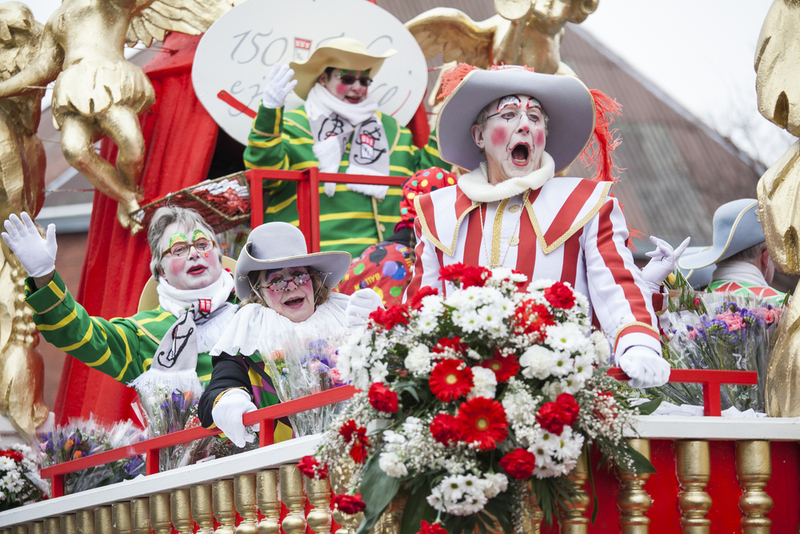 As part of the broader ‘carnival’ period that traditionally takes place in the lead up to the Christian season of Lent – celebrated from Rio to Rome – Cologne Karnival has been an institution of the German Rhineland since time immemorial. Since 1814, however, after the French Revolutionaries left Cologne to the Prussians, locals took the opportunity to properly ‘organise’ this weeklong event once and for all. In 1823, the “Festordnendes Komitee” was set up, the driving force behind the festival today, and under the wing of the new committee, the festival grew in popularity, with hallmark events and traditions developing throughout the decades. Each year, the committee delineates a new ‘motto’ or ‘theme’ for the festival, setting the tone to make each Karneval unique. This year’s: Mer stelle alles op der Kopp, or ‘We go topsy turvy,’ is sure to capture mad imaginations all over the world. The Festivities: what goes on? The Crazy Days in Cologne kick off traditionally on the Thursday before Ash Wednesday. Known as Fat Thursday, Women’s Day, or Weiberfastnacht, you won’t see much in ways of parades on Fat Thursday, but work ends for most folks at midday, leading to a fair swathe of cosplay and drinking in the streets. At 11.11am, the festival is officiated by a fruity trio called the Dreigestirn – official festival mascots: a virgin, prince and a farmer, or Jungfrau, Prinz, and Bauer, who pay for the privilege of overseeing the week’s events. In some parts of the Rhineland, the women take over on Fat Thursday, sticking it to the patriarchy by snipping men’s ties off with scissors, followed by ritual stormings of the town halls. The disenfranchised men, rueing the destruction of their ties, are generally compensated with bützchen, or ‘little kisses’ from the offending fraulines. With a number of debauched relics from Weiberfastnacht still roaming the streets, Friday, Saturday and Sunday at Cologne Karneval amounts to a non-stop festive moment: dancing and frolicking, masquerade, street music, delicious food, masked balls and good times aplenty. Without doubt the climax of the festival, the parade on Rose Monday (Rosenmontag) attracts over 1.5 million revellers, decked to the nines in fancy dress and festive carnival garb. Forget Moomba and the Tamworth parade: the event on Rose Monday showcases over 10,000 participants, with 500 horses, 130 floats and 120 bands! Expect the hurling of sweets (Kamelle) and small flower bouquets Strüßjer – and for those lucky enough to receive, requisite pecks on the cheek (bützje). “Kölle Alaaf” is shouted through the streets in wild conviviality during Rose Monday: “Long live Cologne!” as the energy of the day blurs into one hefty, night-long party full of drinking and dancing, to a closing time that never comes. There’s no stopping the fancy dress, with even more parade events throughout the city. Parties kick on right through until after midnight, culminating in the ritual burning of ‘the Nubbel,’ a straw figure in the shape of a man, who’s sacrificial immolation functions to appease all sins and transgressions committed by festival-goers during the overindulgence blowout of the week prior. The end of the line, the great hangover to end all hangovers. Nubbel burnt, sins repented, life goes on: slowly, surely, with nothing but blurred memory of timeless festivity, and the excitement of the next year’s festival to come. So, are you ready to get your crazy on and come party with us? No need to book that flight to Deutschland: get on down to Hophaus at Southbank for a week of wild Karneval action. Between Thursday February 4 and Sunday February 14, clown up, frock up and dust off your cosplay finest –we’ll be pouring specialty biers flown in exclusively for the occasion, a sumptuous menu of delicious Karneval fare, culminating in our world famous Hophaus ‘Best Dressed Competition’ on Saturday February 6. Best yet, we’ll also be tapping a special keg on Friday Feburary 5, and dishing out the Frei Bier while it lasts. Lunch & dinner bookings recommended 9682 5900 or prost@hophaus.com.au.